Signs of the Times - what the world will be like just before the return of Jesus Christ! THERE SHALL BE "WARS AND RUMOURS OF WARS, with nation rising against nation, and kingdom against kingdom." (Mt.24:6,7) Although the World has always known war, it wasn't until 1914-1918, and then again from 1939-1945, that total World War was waged! Over 100 million people have been killed in wars since the 20th Century began, over 2 trillion dollars have been spent on arms and over 150 wars have been fought! "AND THERE SHALL BE FAMINES AND PESTILENCES AND EARTHQUAKES IN VARIOUS PLACES!" (Mt.24:7) The World Health Organisation estimates that about one-third of today's World is well-fed, one-third is under-fed and one-third is starving! Four million people die each year of starvation. If you are an average reader, since you began reading this, over 30 people have died of starvation, as famine is claiming over 30 lives per minute right now! ACCORDING TO THE WORLD ALMANAC, THERE WERE ONLY SIX EARTHQUAKES of major strength between 1800-1896. But in each decade from 1897 until 1947 there were either two or three, in the decade from 1947-1956 there were seven, and from 1957-1966 there were 17! Since 1975 there have been over 50 significant earthquakes! In fact, 25 of the 49 largest earthquakes in recorded history occurred from 1960-1980! "AND THIS GOSPEL SHALL BE PREACHED IN ALL THE WORLD for a witness to all nations; and then shall the End come!" (Mt.24:14) He said these other signs would only be "the beginning of sorrows" (Mt.24:8), but that when the Gospel is preached in all nations, then would come the End! Never before has the Gospel been preached in all the world as it is right now!--Not only by travelling missionaries, but by the modern mediums of radio, television and printed literature! Every nation on the face of the Earth today has heard the Gospel!--"Then shall the End come!" UNTIL JUST A LITTLE OVER 100 YEARS AGO, people's means of travel hadn't changed for thousands of years! Mankind still travelled by foot, animal or sailboat etc. But today, we not only drive at tremendous speeds, but fly and even go to the moon!--Over 200 million people now travel outside their own countries every year! "KNOWLEDGE HAS INCREASED" ALMOST UNBELIEVABLY! More has been discovered by science in the last 100 years than had been discovered or invented in the entire previous 6,000! Experts estimate that it now takes less than five years for man's store of knowledge to double!--And more than 80% of all the scientists who have ever lived are alive today! "AND THE DAY OF CHRIST'S SECOND COMING shall not come, until there come a great falling away from the Lord first!" (2Th.2:3)--Entire nations that were once Christian have now "fallen away" from faith in God and His Creation to the ridiculous lie of Evolution! IN THE U.S., VIOLENT CRIME HAS RISEN BY 1,600% in just the past 20 years!--Costing an estimated 12 Billion U.S. Dollars annually! The U.S. Surgeon General reports that "violence in all its forms is now the nation's number 1 public health problem!" Studies have shown that by the time the average American child is 15 years old, he will have personally witnessed the violent destruction of more than 13,000 human beings acted out on television! "AND THERE SHALL BE UPON THE EARTH DISTRESS OF NATIONS, WITH CONFUSION; THE SEA AND THE WAVES ROARING!" 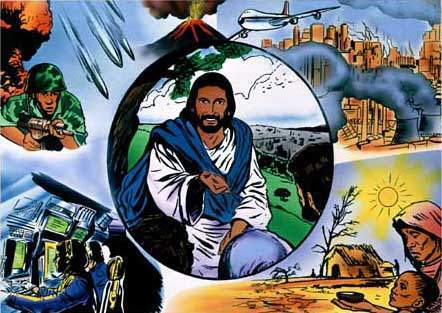 (Lk.21:25)--This is speaking symbolically of the peoples and nations of the World.--Every time you watch the news on the television, it roars!--With the waves of new wars, riots, rebellions and more terrorism, strikes, problems, chaos and confusion! ONE STARTLING FINAL SIGN OF THE VERY END that is about to come to pass very soon is the rise of a powerful One-World Government led by a Satanic Dictator known as the Antichrist! (Rev.13) After 3-1/2 fairly peaceful years of his reign, he will suddenly demand that the World worship him as God, persecuting and warring against all who refuse!--A time of "Great Tribulation"! "IMMEDIATELY AFTER THE TRIBULATION SHALL APPEAR THE SIGN OF THE SON OF MAN IN THE SKY, coming in the clouds of Heaven with power and great glory!" (Mt.24:29-31)--Exactly 3-1/2 years after the Antichrist demands the World's worship, Jesus will return to rescue His saved children from their persecutors, destroy the Antichrist and his forces and take over the World to set up the Kingdom of God on Earth! ARE YOU READY FOR THESE LAST GREAT FINAL "SIGNS OF THE TIMES"? You can get ready now by receiving Jesus into your heart. Simply pray this little prayer and He will come in: "Dear Jesus, I believe that you are the Son of God and that You died for me. Please forgive me for all my sins. I ask You, Jesus, to please come into my heart and give me Your free Gift of Eternal Life! Help me to love You and believe Your Word and do my best for You and others. In Jesus' name I pray. Amen." GOD BLESS YOU! We love you!